On September 20th, 2014, I attended and spoke at a celebration of Jim Foley’s writing and life, in Amherst, Massachusetts. Jim was the first American journalist murdered by ISIS on August 19, 2014, in the Raqqa area of Syria. He was also my friend and former classmate. We were students in the MFA program at UMass, from 1999-2002. It was important to me to be in Amherst that day with old friends, remembering Jim, and I am grateful to have been able to get away during the busy first month of school. I wrote up some memories of Jim, too, which I want to turn into a real essay at some point. Right now, I’m thinking about tomorrow’s Parent Night. I am always still amazed at how life goes on, after happy days and after awful events. I think about Jim every day. Thank you, Shauna Seliy, Brian Jordan, Erin White, and Noy Holland, for organizing Saturday’s tribute to Jim at UMASS. And thank you for asking me to write something to share something about my memories of Jim. It was as hard to do as writing ever is. So much to say and how to say it, where to start, especially in front of a room full of writers. It was for Jim and so I had to try. I am honored, Brian and Shauna, that you thought to include me and asked me to read one of Jim’s articles about Syria at the event. I hesitated, not feeling up to it, and am glad that I pressed through and did it. More than anything, it was an honor to meet and hear Jim’s beautiful, amazing mother, Diane Foley. Her graciousness and presence, her heart and strength–these I will always remember. I was heartened to hear the stories of Jim read by Erin (Erin shared her remembrance first, and then read memories of Jim sent in by Matt Basiliere, Yago S. Cura, Chris Carrier, Daniel Presnell, myself, Laura Dave). Daniel Mahoney got up and spoke from the heart after driving six hours to get to Amherst from Maine. And then to see others from that time…Lisa Olstein (who traveled from Texas), and Robert T. Hayashi, Wendy Bergoffen, Sylvia Snape, Jean Marie Ruiz, Stephen Clingman, Andrew Varnon, Sam Michel. And others who were there, just to support, Sabina Murray, Edie Meidav. Brian Jordan read Jim’s gorgeous, funny, prize-winning story, “Notes to a Fellow Educator,” Martin Espada read from Jim’s MFA thesis, Noy read some of her memories of Jim and shared some writing sent to her by John Edgar Wideman, with whom Jim had also studied. Towards the end of the tribute, Shauna read from emails she and Jim had written back and forth to each other for years, while in different cities and countries. To hear his voice from those emails and even text messages transported us and it was a great gift for Shauna to share them. I can still hear her saying “FoleyPhoenix,” –part of his email address. Now I think of Jim as a phoenix, rising. Their deep love, their friendship, their mutual regard, and their shared commitment to writing over so many years…to writing novels, to writing anything, to encouraging and cheerleading each other–all of that came through the steady correspondence and reminded me of the special nature of the friendships we made and years we had at UMASS. I know there are so many others who wished they could be there and we were thinking of you, too. We are together in our love for Jim. 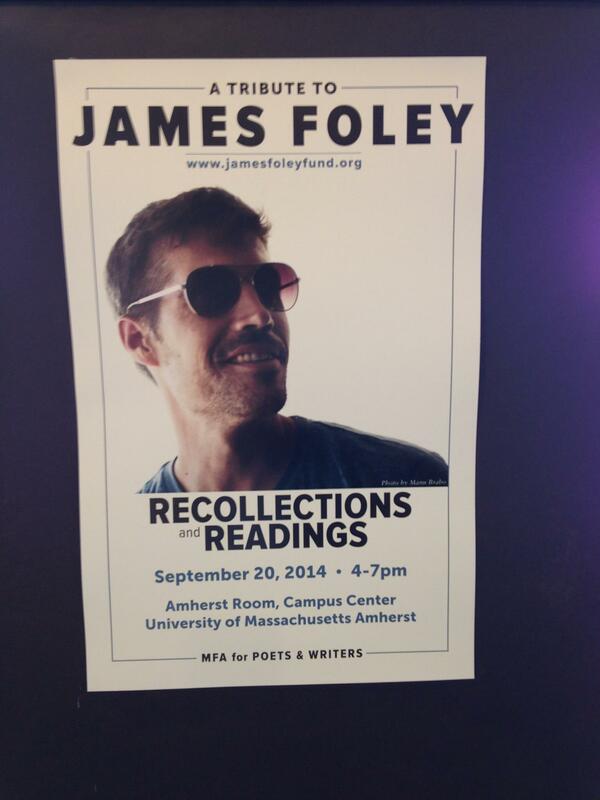 Poster of the UMASS Amherst Tribute for Jim Foley. Photo credit of poster: Shauna Seliy. Photo credit of Jim: Manu Brabo.